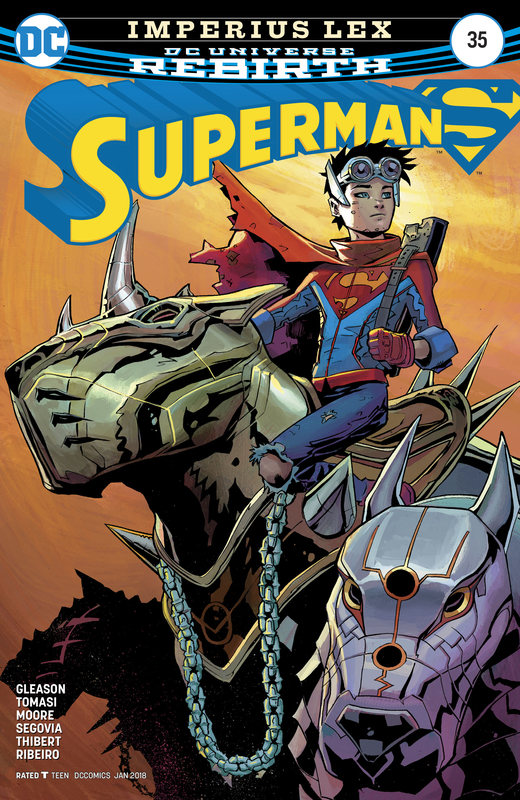 With Superman roped into his mess, Lex does his best to help them both escape the fanatical citizens of Apokolips. He reveals to Superman that by wearing his family crest he had brought hope to the people but now they believe him to be a false prophet and Superman is the true successor to Darkseid. Jon rescues a caged warhound pup and discovers that the planet may have more to it than death and destruction. As the Furies join the pursuit, Superman spies their new member is Lois and must figure out a way to get Lex and his family home. When Kalibak appears, a misfired weapon may have done some irreparable damage, the cavalry arrives just in time but could they make a bad situation worse? Story - 5: There are four stories interweaving here and each is compulsive reading. I loved that Lex was to Apokolips what Superman is to Earth. The scenes with Jon felt like he was starting to grow, become more fleshed out. Too many times lately he's played second fiddle to Damian or used as a plot device, so it was great to see him interacting with the Warhounds. Lois took a bit of a backseat this issue but I'm sure that will change with both Lois exclaiming 'Clark!' and Jon yelling out 'Let my mom and dad go!'. Lex is already suspicious, so it will be interesting to see where this will go next. Art - 4: Some stunning action visuals, with some memorable scenes. I really liked what they were trying to achieve here especially the scene where Superman has the mask on. I felt the pencils stumbled somewhat when the characters had moments of stillness. The amazing splash pages made up for those odd panels however! Cover Art - 4: When Jon is drawn as a child and not in a manga style he really has an impact. I'm all for fun and he is a kid after all but sometimes it's nice to see him as a character rather than a bit of a stereotype. The cover is a little spoilery but given the story inside it definitely gives the book more of an impact. 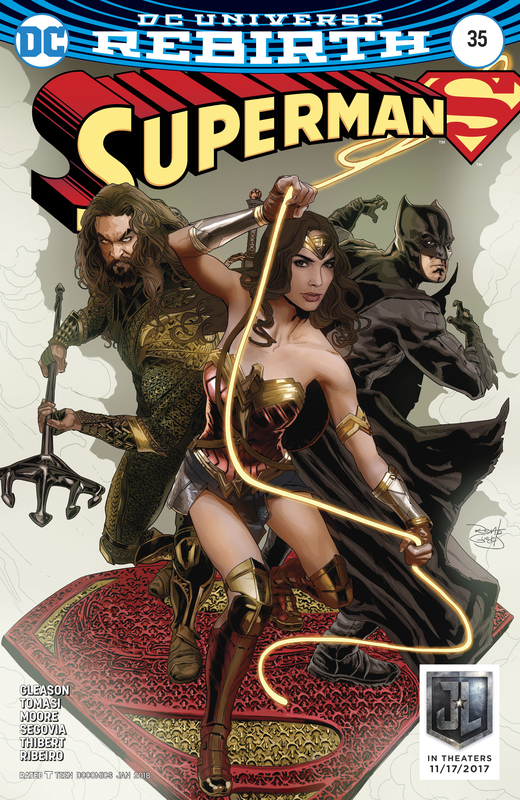 Variant Cover Art - 5: These movie variants are fantastic and former Superman regular Renato Guedes doesn't disappoint with this cover showing Batman, Wonder Woman and Aquaman inspired by Superman's crest.